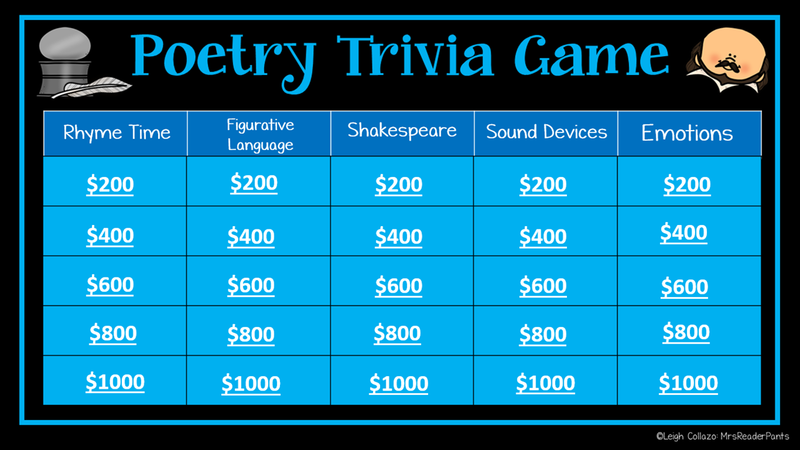 My PowerPoint trivia games have been among my most popular products, and I've just added a new one for National Poetry Month! 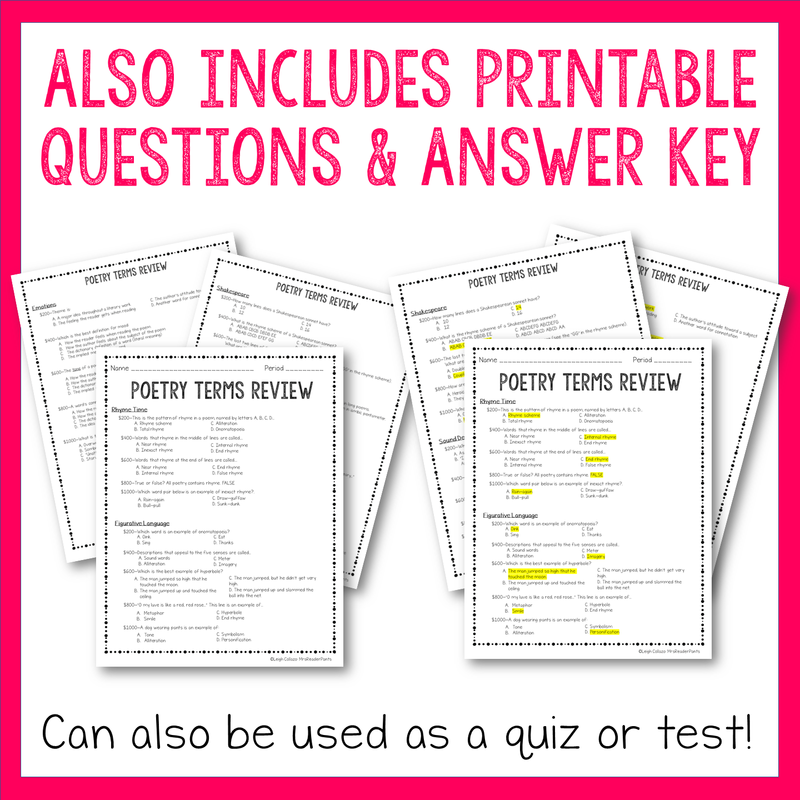 This week's New Product Thursday goes with last Thursday's Poetry Terms PowerPoint and Printable Poetry Packet (how's that for alliteration?!). 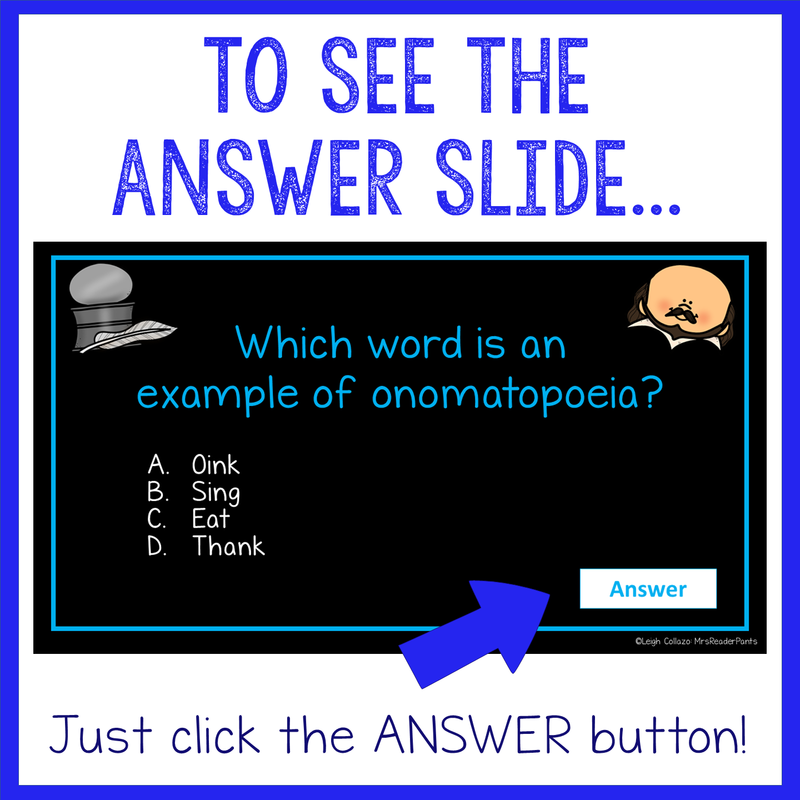 This Jeopardy-style PowerPoint game will help your students review the terms included in the Poetry PowerPoint from last week. 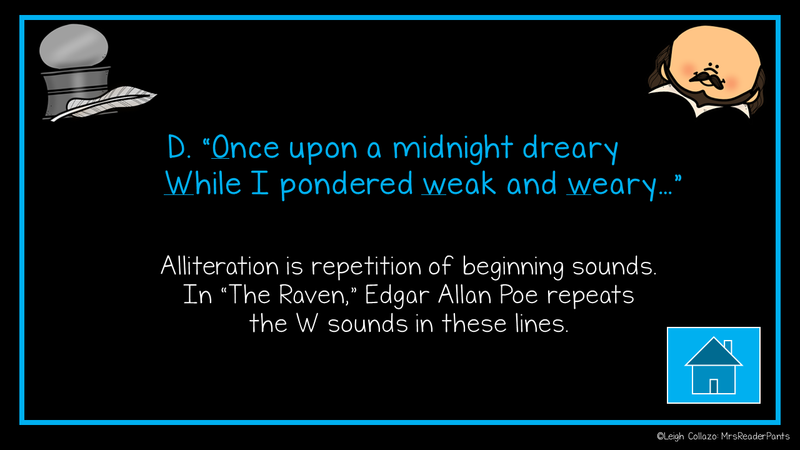 I plan to add one more set of poetry activities next week to round out the unit, just in time for National Poetry Month in April. Yes, I do plan to bundle the unit when it is complete, but the unit won't be 50% off like it is each week as I release them. As always, this newest product is half-off through Saturday, March 24 at noon, CST. There are 25 questions in five categories. 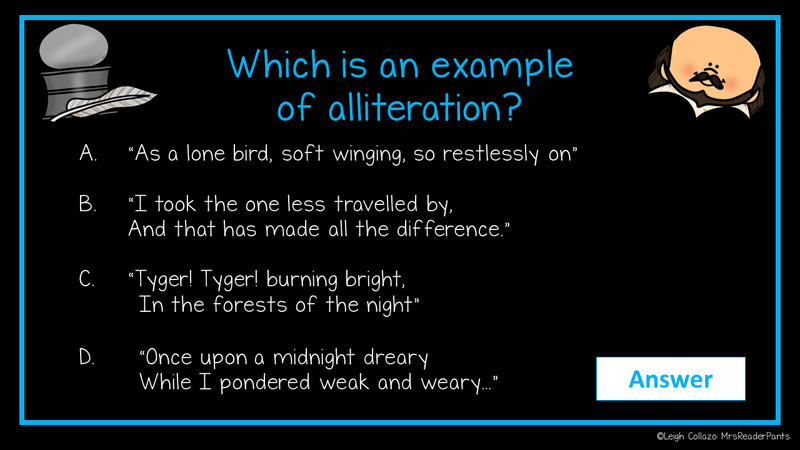 I wanted to make the game an easy and fun terms review for students in Grades 8-11, so I made almost all of the questions multiple-choice. I will say that my sixth grade son played the game and, with no prior instruction from me, he still got many of the answers correct. 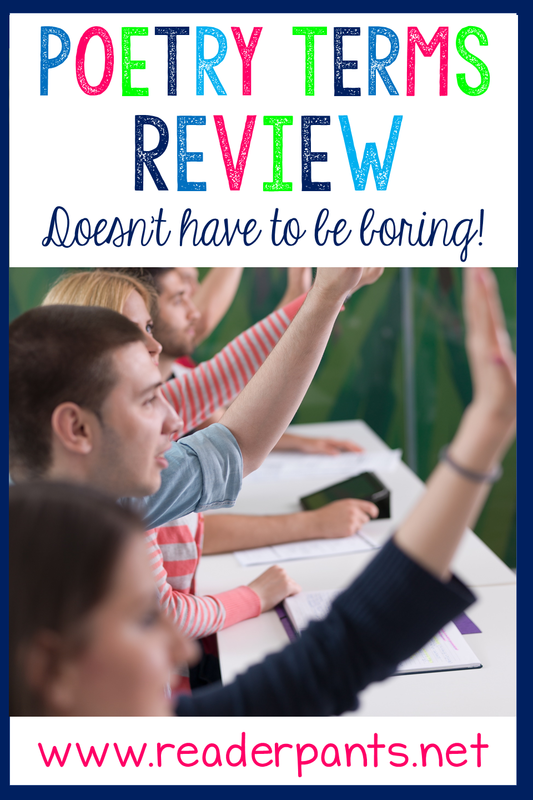 I don't think it will be too difficult for younger grades, especially when students are nearing the end of a poetry unit. 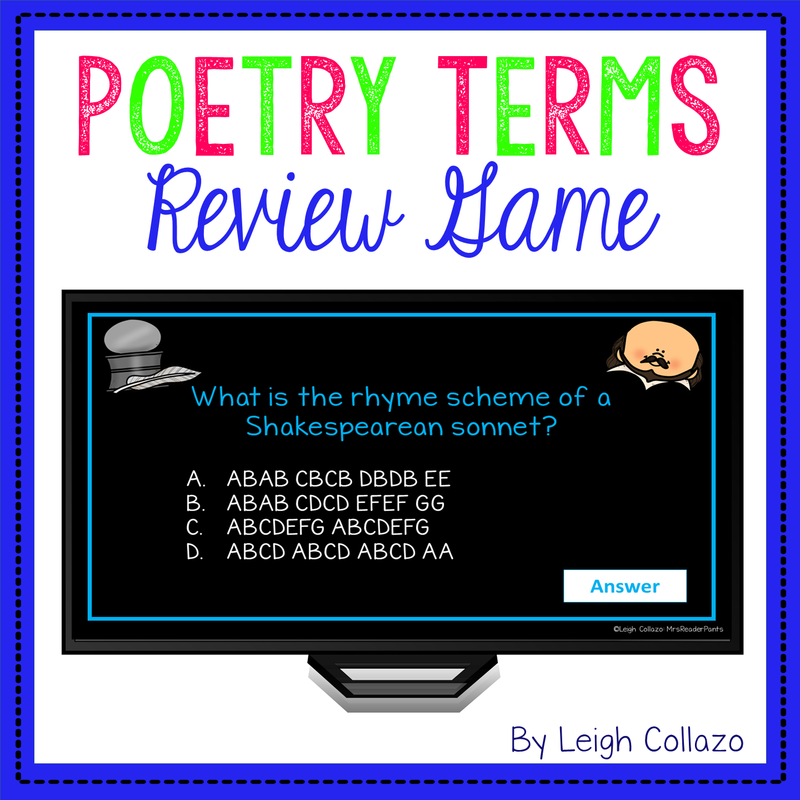 Questions in this game include the following poetry terms: rhyme scheme, internal rhyme, end rhyme, sonnet, lines, figurative language, imagery, personification, onomatopoeia, hyperbole, simile, alliteration, sonnet, Shakespearean sonnet, couplet, heroic couplet, iambic pentameter, foot, meter, connotation, denotation, tone, mood, and theme. The poems above are in the poetry packet from last week's New Product Thursday.